We use a job to check for changes on a particular branch for all the gerrit projects. But sometimes we find that it detects the change, but it doesn't show in Change section of the build. 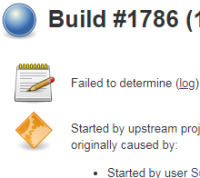 We face this error - Failed to determine (log).